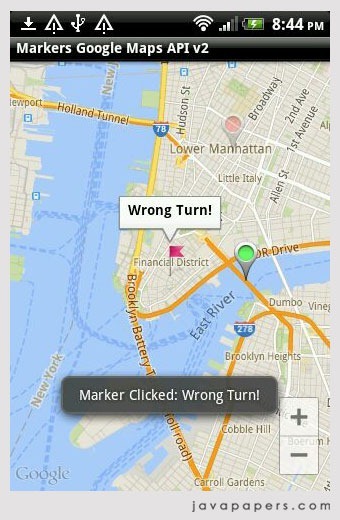 This Android tutorial will show how to use markers to display positions using Google maps Android API v2. We will also see features related to using markers like changing the default color, replacing the default icon with a custom icon-image, allow user to drag the marker, show our current position using marker and related event listeners like on-marker-click and on-marker-drag. Refer the previous Android tutorial on how to draw lines on map using Google Maps Android API for basics on Google maps and prerequisite. Now lets directly jump to the tutorial on adding markers. In the GoogleMap instance we have created call the method addMarker by passing MarkerOptions as parameter. Use LatLng to define the position to add the marker. MarkerOptions provides variety of options to customize the marker. Following code is to change the default color of the marker. Just set the draggable to true. To add a marker to the current location, we need to know the LatLng. Refer the get current location in Android tutorial to find the current LatLng and using that we can add the marker easily as shown above. Lets see two main event listeners related to markers OnMarkerClickListener and OnMarkerDragListener. 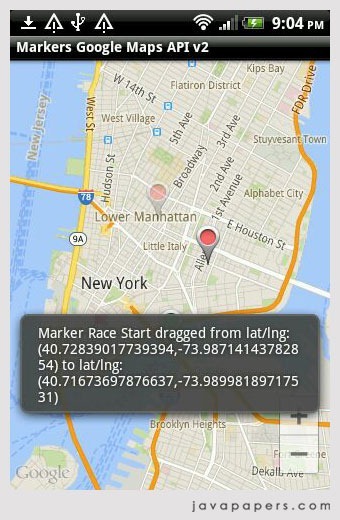 We need to implement these interfaces and add its instance to the GoogleMap instance to track the events. OnMarkerClickListener has one method onMarkerClick to be implemented. Using the Marker instance passed as argument we can know which marker is clicked. OnMarkerDragListener has got three methods to be implemented. onMarkerDragStart, onMarkerDrag and onMarkerDragEnd. Use onMarkerDrag method cautiously as it will be invoked all through the drag position. Following is the complete code of map activity. Comments on "Markers–Google Maps Android API v2"
Planning to make a game using this. Thanks for this valuable information Joe. Thanks all of your examples are awesome and also coding style are very good again thanks for sharing. this tutorial examples help me lot for any android beginners. FragmentActivity cannot be resolved to a type. This was the error i got while execute ..
sir v nice tutorial ,i wanted to ask you , can you help me in showing distance inside the infowindow ?? Do you have such tutorial ? Comments are closed for "Markers–Google Maps Android API v2".